Disney's Animal Kingdom Park is only 3 miles - a 5 minute drive! NEWLY REMODELED! We have just updated the home with major changes! The kitchen has been redone with beautiful custom cabinetry and granite counter tops and all new stainless steel appliances. The living room TV has been upgraded to a 60 inch HD TV and the sixth bedroom now has a very comfortable queen sleeper sofa with memory foam mattress and features a 50 inch HD TV for all to enjoy as well. All of the bathrooms have new granite countertops, new sinks and new bathroom fixtures. This home is now really special and if you like luxury - you will love the changes to this home for your family and friends! This is a 6 bedroom, 3.5 bath resort home with large private heated pool, spa and is fully screen enclosed to eliminate any flying pests for your enjoyment. Feature a large deck with plenty space to have pool fun. The and big screen TVS. Plus Windsor Palms resort is gated and security guarded 24/7/365 with huge clubhouse offering movie theatre with free movies, lighted tennis courts, large resort pool and spa, sand volleyball courts, basketball court, large fitness center, game room and Sundry shop on site. The home features three bedrooms with king size beds and two have en-suites. The home has a fourth large adult bedroom with queen bed. The fifth bedroom has two twin beds and the sixth bedroom can double as a den/tv room place to get away for privacy. This room offers a queen size sleeper sofa, note the mattress has been upgraded for the guest comfort with luxurious memory foam mattress and adjustable head rest. Every bedroom offers personal closets. Located less than 2 miles from many restaurants and shopping and only 3 miles to Disney's Animal Kingdom Park. A very special home for a very special vacation! The home has had a total kitchen and laundry makeover and many new furnishings including new dining room furniture and bar stools. We have added an additional 60 inch HD tv added to the living room. The laundry has had TWO new may tag dryers added. Anyone who has stayed in a large home with a large group of people understands the value of having two dryers! Be sure and check out our other properties. Listing numbers 4559 - a 3 bedroom, 2 bath home custom built for me that is over 2,000 square feet and has a large pool with exceptionally large shallow end for children; Listing number 7170 - a 4 bedroom, 3 bath custom luxury home built for our personal use that is over 2,500 square feet. It is located on a large pie shape very private yard overlooking a lake and conservation area and is very private - we are now offering it to guest who want something special. Finally, listing number #9392, a custom built 4 bedroom, 3 bath condo that is over 1,800 square feet. Originally custom built for my parents in Sun Lake Resort - it is located only ONE mile from Disney with over 20 restaurants within a short walk of 4 blocks or less. english, spanish, We have staff fluent in Spanish! I became a Floridian in 1995 and built our first 'vacation home' in 1996. We have since moved into a larger home as we ended up creating a family business here. We love meeting new people and retaining the friendships from our many guest over the years. We have not had over 2,000 families to stay in one of our homes. We have 8 properties - enough to make sure we can help you with your needs - but not to many that we can't keep them up to date to meet YOUR needs and desires! We are constantly working to maintain, freshen and even totally renew these homes if needed. My Dad taught me early - maintain your property and it will maintain you! We take pride in our homes and we hope you appreciate our efforts. We enjoy meeting people and helping them to have their best vacation ever! We believe in offering a quality home at a great value. You will not find us to be the least expensive - if you are looking for cheap - that is not us! If you are looking for quality and value - you have met the right people. We believe in the credence of defending our price - not defending our home. They will always be clean, in good maintenance repair and have the appliances working during your stay. Our goal is to make you an extended family member and return to see us over and over with your family and or your friends! Location! Family vacations! Great for Conventioneers who want to bring family are who want a large home with many adult bedrooms! 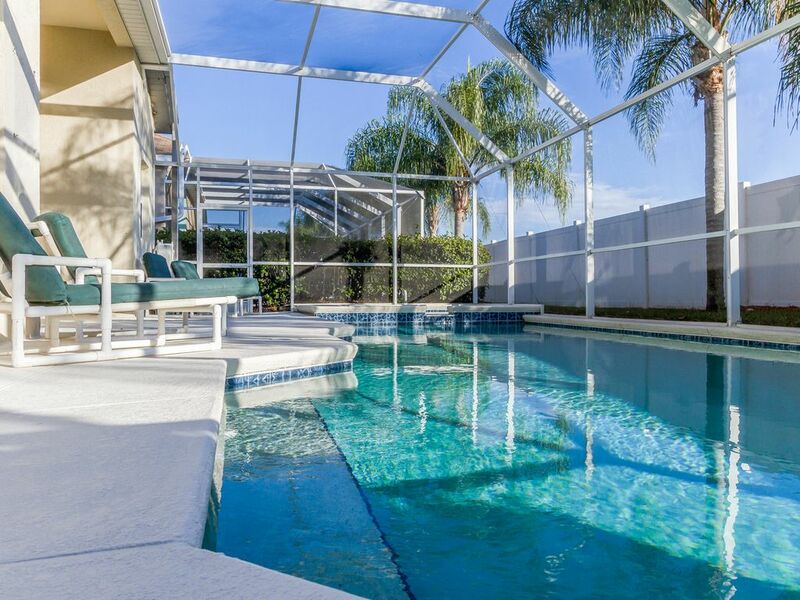 Grand Kids will love the huge private pool as well as the resort recreational offerings and located only 3 miles to Disney World Parks. We are conveniently located to all the major airports - we have 4 of them located between 25 minutes and 1.5 hours from our property. I-4 is only 4 miles away, so you can get to all the attractions, convention center and many, many fine golf courses within minutes from our location! Sunshine! Weather! Theme Parks! Beaches! Airport Travel! Eateries! Golf! Professional Sports! All the Windsor Palms resort amenities are only one block from our home. Please check out the resort community by going to www.windsorpalmsonline.com All of this is included in your rental! Pool Heat can be added for $35 per day plus tax. 50inch HDTV, 6 other flat screen TVs, Luxury Decor, All Pillow Top Mattresses, Tile Floors, Full Laundry room with Washer, and Iron, Hot Tub, Private Oversized Heated Pool, 24 Hour Gated and Guarded Entry, Close Proximity to Disney, Games Room.